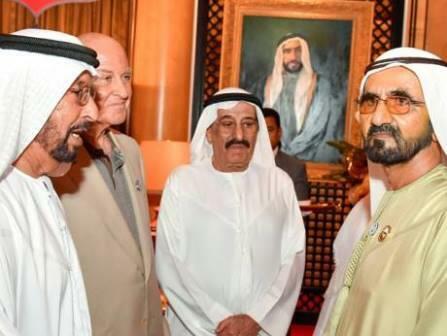 Dubai: His Highness Shaikh Mohammad Bin Rashid Al Maktoum, Vice-President and Prime Minister of the UAE and Ruler of Dubai, received a host of well-wishers for Ramadan at Zabeel Palace on Saturday evening. Shaikh Hamdan Bin Mohammad Bin Rashid Al Maktoum, Dubai Crown Prince, Shaikh Maktoum Bin Mohammad Bin Rashid Al Maktoum, Dubai Deputy Ruler, and other shaikhs and senior officials were also present. Shaikh Mohammad interacted with his guests and exchanged greetings on the occasion of Ramadan. He prayed that the Almighty blesses the UAE and its people with unity, solidarity, and tolerance, especially during this month of generosity. In Sharjah, Dr Shaikh Sultan Bin Mohammad Al Qasimi, Supreme Council Member and Ruler of Sharjah, also received well-wishers at the Al Badiee Palace. The Ruler, accompanied by Shaikh Abdullah Bin Salim Bin Sultan Al Qasimi, Deputy Ruler of Sharjah, greeted well-wishers who included senior officials, tribal chieftains, citizens, members of Arab and Muslim communities and residents. In Ajman, His Highness Shaikh Humaid Bin Rashid Al Nuaimi, Supreme Council Member and Ruler of Ajman, received well-wishers at the Al Zaher Palace. In Fujairah, His Highness Shaikh Hamad Bin Mohammad Al Sharqi, Supreme Council Member and Ruler of Fujairah, received a gathering of well-wishers who had arrived at his Rumailah Palace to offer greetings. In Umm Al Quwain, His Highness Shaikh Saud Bin Rashid Al Mualla, Supreme Council Member and Ruler of Umm Al Quwain, received at his palace the well-wishers. Shaikhs, senior officials, tribal leaders, citizens and residents were among the well wishers. In Ras Al Khaimah, His Highness Shaikh Saud Bin Saqr Al Qasimi, Supreme Council Member and Ruler of Ras Al Khaimah, also received well-wishers at Khazam Palace.